Home > Heavy Duty V Belts > V-Belts. A, B, and C Sections. 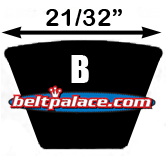 Standard and Kelvar Construction > Classical B Section 21/32 inch (.66") Wide. Classical V-Belts. > B107 Industrial V-Belt. Classical V-Belt B107. 110" Length, 0.66" Top Width. 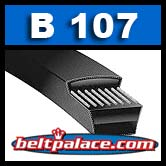 B107 Industrial V-Belt. 110" Length, 0.66" Top Width. Replaces Scotts Mower belt M1100318.